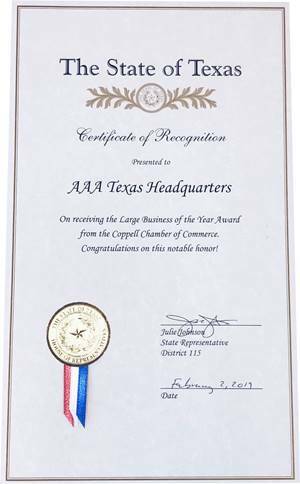 State Representative Julie Johnson, Texas District 115, also attended and presented AAA Texas with a certificate recognizing their achievements. The certificate is shown at right. Since moving its headquarters to Coppell in 2015, AAA Texas has continued to increase its community involvement by supporting traffic safety education programs for new teen drivers, adults, and mature drivers.